Learn how to make coconut milk, coconut butter, and coconut flour from shredded coconut. It's easy, inexpensive, and you control the ingredients. Those who know me well know that I should have been born somewhere with coconut palms. Not only do I love coconuts, but I also love the tropical climate that coconut palms need to survive. 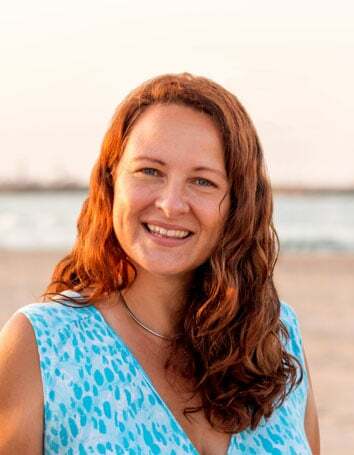 While I have moved a bit closer to the tropics by moving to the Spanish Riviera from Michigan, I don't live in a climate that allows for coconut palm trees; nor do I live in a place where it is easy to find coconut butter or coconut flour. I can find coconut milk in a can, but it costs an overpriced three and a half euros. Why make homemade coconut milk? Not only is homemade coconut milk much cheaper than the coconut milk that you buy in the stores, but it's a lot more natural. It doesn't have all of the unwanted ingredients found in canned coconut milk, nor do you have to worry about the BPA or other endocrine disruptors in the lining of the cans. 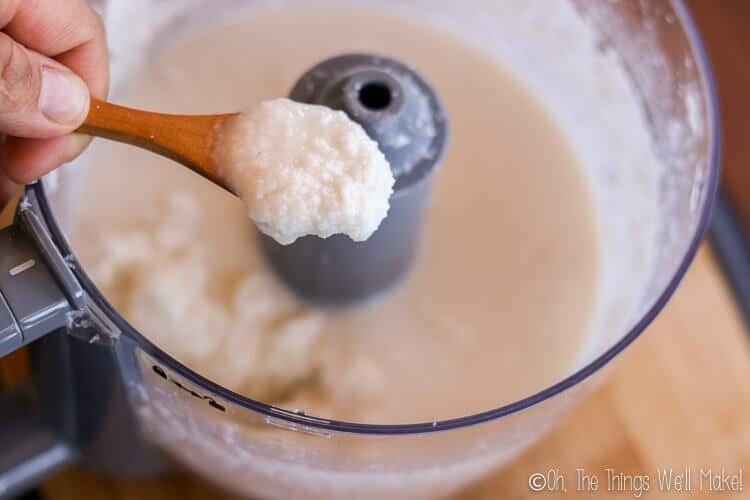 Making the coconut flour is really just processing a byproduct from making coconut milk, so I'll show you how to make both at once. First, decide how much coconut milk you want to make. To make the coconut milk, you'll use 2 parts water to 1 part unsweetened shredded coconut. So, if you need 2 cups of coconut milk, plan on using just over 1 cup of shredded coconut and add slightly more than 2 cups of water to it. Some of the water will remain with the fiber of the coconut, so you want to account for that. That day I decided I wanted to make about 4 cups of coconut milk, but didn't need it to be precise, so I used two cups of shredded, unsweetened coconut and 4 cups of water. Most of the time I make smaller batches, so I wrote the recipe for making 2 cups of coconut milk. You can easily adapt it to make as much as you need. Homemade coconut oil is best when used immediately. If you leave homemade coconut milk sitting around, it will begin to separate into two layers, a watery layer below and a thick, creamy layer above. Another difference between homemade coconut milk and the coconut milk that you buy in stores is that it tends to separate. Coconut milk is made of the fat of the coconut and water. Because fat and water don't mix, and we aren't adding any emulsifiers, the coconut milk will slowly start to separate into two layers. 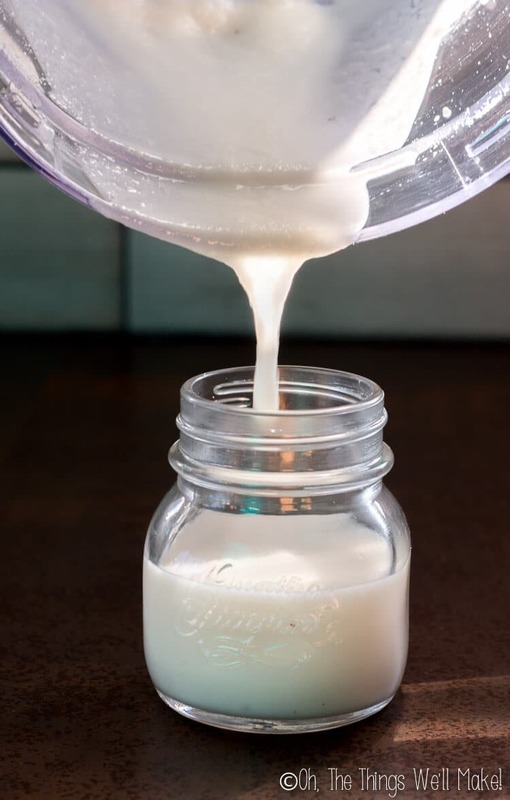 If you store homemade coconut milk in the fridge, it may develop an oily, solid layer on top and a liquid, watery layer below. If you do need to store it, it's best to reheat it and stir it to help combine the layers before using it. Use it within a couple of days or it will start to sour. I'm combining these 2 recipes into one because making coconut flour just follows the process of making homemade coconut milk, as you will see below. It's easy to make coconut milk and coconut flour from shredded coconut. It’s an inexpensive natural alternative to commercial milk with thickeners and other additives. Soak the shredded coconut in the water for 1-2 hours. I let it soak in my blender jar because I'll be using it in the next step anyway. Blend the coconut and water mixture in a blender for a minute or two. Meanwhile, prepare a cheesecloth or white cotton towel and a bowl. Pour the mixture into the cloth, and strain. 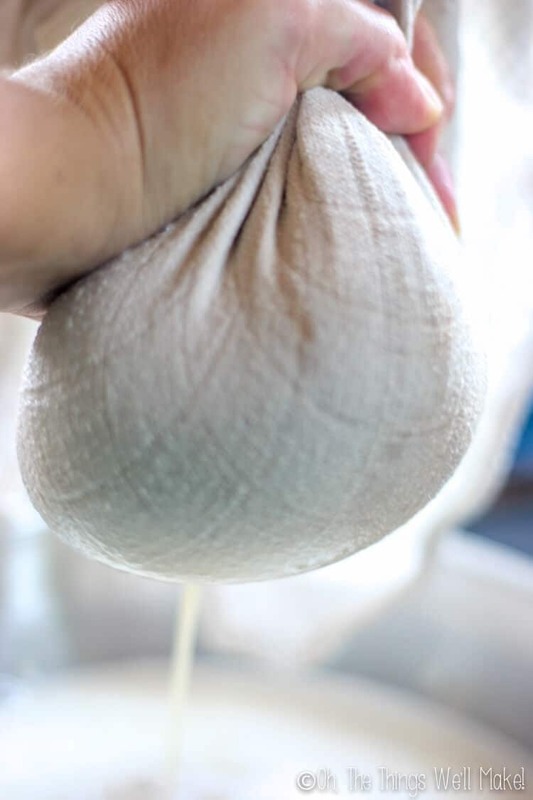 The liquid that you squeeze out of the cloth is your coconut milk. You can use it right away, store it in the fridge for a couple of days, or freeze it in ice cube trays (I use and love these) for easy future dispensing. Don't throw away the coconut fiber in the cloth. It will soon become your coconut flour! Take the pulp that is left over after straining your coconut milk, and spread it out in a thin layer on a baking sheet. I lined the sheet with some parchment paper first. Grind in a coffee grinder or a food processor until you get as fine of a powder as you can with your particular machine. Even if it doesn't get completely powdery or flour-like, it should still work quite well in recipes that use coconut flour. Nutritional information assumes approximates one 1/2 cup serving of coconut milk plus 1/4 cup of the resultant coconut flour. Coconut flour is a high fiber, low carb “flour” that can be used in place of wheat or other grain flours in cooking and baking. It is especially used in recipes for diets that seek to eliminate wheat flour like gluten-free diets, GAPS, and paleo diets. You have to be a bit careful when replacing it in baking as coconut flour tends to be a bit drier (you'll probably need to add some more liquid to compensate) and it has a different consistency than wheat flour. You could substitute a small percentage of it, though, in a recipe to reduce your flour intake. Luckily, there are a lot of good recipes out there that use it. 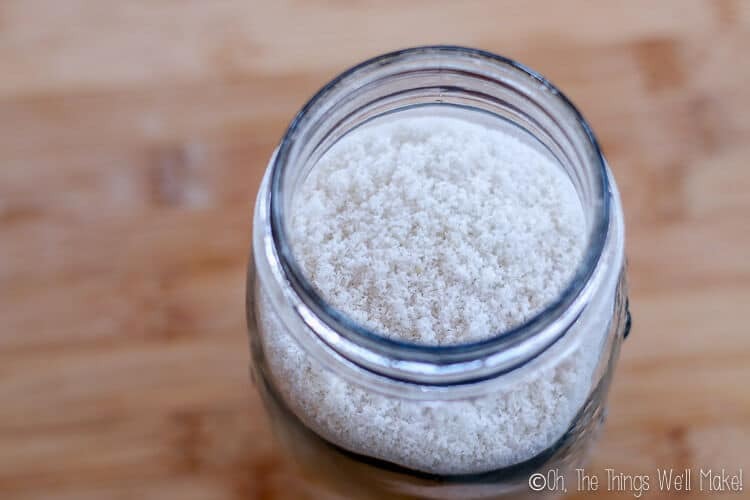 When making homemade coconut flour, depending upon the type of food processor you have, you likely won't be able to “mill” it as fine as store-bought coconut flour. For most recipes, that shouldn't be a problem, but it is something to keep in mind. To get it finer, you can try running it through a coffee grinder after the food processor. Coconut butter is a cream made from pureeing dried coconut. It is a whole food that includes the fat and fiber of the coconut. Not too long ago I mistakenly thought that coconut butter was just a term that people used for coconut oil when it reached its solid state at cooler temperatures. I later found out, though, that coconut butter and coconut oil are really two different, wonderful things! Coconut oil is different from coconut butter because it coconut oil is the fat of the coconut, separated from the coconut fiber. It is white as a solid, but it is a clear, transparent liquid when the temperatures are warm enough. On the other hand, Coconut butter has coconut pulp in it. So, even when temperatures are high, it is white and more like a nut butter, definitely not a liquid. Now, in the summer heat, mine has separated with a thin layer of coconut oil floating on top. In the winter, it's a lot harder to coconut butter because it becomes almost rock solid! That's why you want to pour the homemade coconut butter into a storage container right away after making it. You don't want it to solidify in your food processor making it almost impossible to remove later on. Smooth and creamy, coconut butter can be used as a spread or used in smoothies and other recipes. If you are having problems getting your coconut butter to form, stop every minute or so, at first, and scrape down the sides so that your blades can reach all of the coconut mixture. Also, make sure you use enough coconut to have a big enough mass for your blades to reach it all well. If you have a high potency blender, you can also use that, but you will likely have to stop to push the coconut down from the sides more often. At first, you will notice the coconut getting a little bit clumpy. Keep processing, and it will start to release its oils. Once some of the liquid from the oil is released, it makes it easier for your food processor to work the rest of it. Keep processing until you get the consistency you like. Even in the winter, this should work because the heat from all of the blending makes the coconut butter creamy. 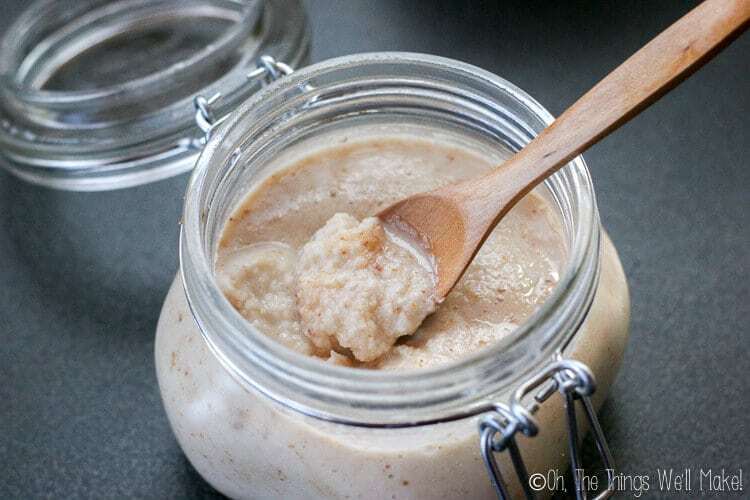 Pour your recently made coconut butter into the container you want to keep it in as soon as you can, though, because in winter it will soon harden up as it cools off. You may also choose to pour it over a baking sheet lined with parchment paper or silicone so that it hardens into a thin, easy to use layer. In the summer it will stay creamy, so you can leave it out of the fridge for easy use. I actually like to eat it plain, as is. I’m a coconut fanatic, though. Basically you should be able to use in the same ways that you would use nut butters. Shredded coconut seems way to dry to turn into something so creamy without needing to add anything else. If you blend it for long enough, though, it will eventually turn into coconut butter! My old food processor actually took much less time to make the coconut butter. I think the blades hit much lower and so it really kept moving the coconut better, making the process much easier. I was starting to doubt that my newer food processor would even be able to make coconut butter at all, but it eventually did. I experimented with making coconut butter with toasted coconut chips, and I ended up with a delicious toasted coconut butter. I used part of my first batch of coconut butter in my coconut flan. It's also super good in my coconut date balls, a sweet snack that is even autoimmune paleo safe. Do you love coconut as much as I do? Which of these is your favorite? How do you use them? My coconut pulp is still oily and I even put it back in the oven to dry more. Is it supposed to be a little oily than other flours? If it was still oily, you probably could have gotten more coconut milk out of it. You may want to process the grated coconut a couple of times with the water to remove as much oil as possible first. It should then be much easier to grind too. Hi can you use desiccated coconut instead? You’ll want the unsweetened stuff without other additives. Hello! I just read this because because I’m having some trouble with storing freshly made coconut milk. I live in Singapore where access to coconuts is abundant. Yesterday I made a batch of coconut milk with freshly grounded coconut, put it in an airtight container in the fridge and this morning it had separated, cream on top and water at the bottom. But is was also spoiled! The container lid popped when I opened with a gassy noise and the smell was sour. Has this happened to you? This is the second time I try to make coconut milk and it is spoiled the next day. Any thoughts on what I’m doing wrong? If you are having that issue, it’s probably because it’s in too warm of water for too long before blending. I’m since realizing that you don’t really need to use warm water nor do you need to let it soak for very long. In fact, if you are using a blender, you can extract quite a bit of coconut milk from coconut and cool water immediately. If you make it that way, you are much less likely to have that happen. And, yes, I have had that problem when I have had the coconut in warm water for too long. It will start to ferment and go sour! Yes, you should be fine. Normally it’s OK even if you use warm water and let it soak a long time. I used to do it that way. If the temperature is hot where you are, though, and it stays really warm the whole time, it can start to sour. I had that happen once too. I really should update the recipe part to give that warning. I’m slowly making my way through EVERY post on the blog and adding new information, new pics, videos, etc. It’s taking forever, of course, but these sorts of comments really help me fix it up better with important information when I get to it! Hi, by mistake I bought coconut flakes instead of the shredded. Would that work the same? Could I use store bought coconut flour and just add some coconut oil to replace the oil lost in the process of making the flour? That’s an interesting question and one I haven’t considered as it would be more expensive for me to make it that way. Here coconut flour is rather expensive. I’m not really sure how much oil you would need to add or how, exactly, it would turn out. Logically it should turn out like coconut butter, but I’m not really sure. How long does it last the coconut flour?? Thanks!!! In actuality, it will probably keep longer than that because you are removing most of the oils. The oils going rancid is really what is making the shredded coconut go bad. O my gosh! This is amazing, and way easier then I ever imagined. I wish we had a blender while we are here in Costa Rica. Maybe our next place will have one. LOL we decided the next 30 days we would be doing an elimination diet. Coconut milk is acceptable on it. BUT the stuff in stores is junk. You have me tempted to just go buy a blender 😉 Thanks for this amazing post! BE well sista. Wow, I’m sure Costa Rica is lovely! Hopefully you can find an inexpensive one to get you making lots of healthy foods (and piña coladas once off the elimination diet- ha!). I live in Spain, so I’m not really familiar with either Silk or So Delicious. In any case, my guess is that both of these probably use thickeners. 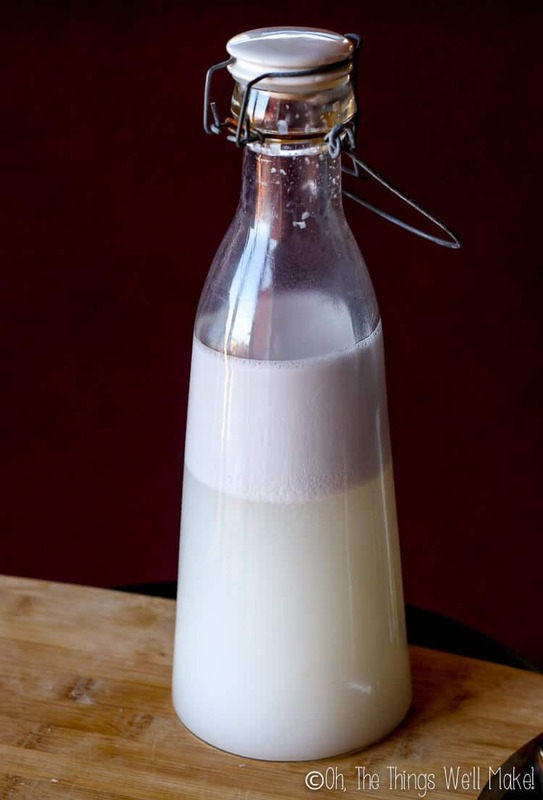 Homemade coconut milk is pretty thin, and doesn’t resemble store bought coconut milk. Adding less water isn’t going to really help fix that. Because it doesn’t use thickeners, it can’t always be used for the same recipes. Some recipes, like those for coconut cream “whipped cream,” rely on the thickeners of store bought coconut milks to work correctly. For drinking plain, though, or adding a bit to tea or coffee, I actually prefer homemade. 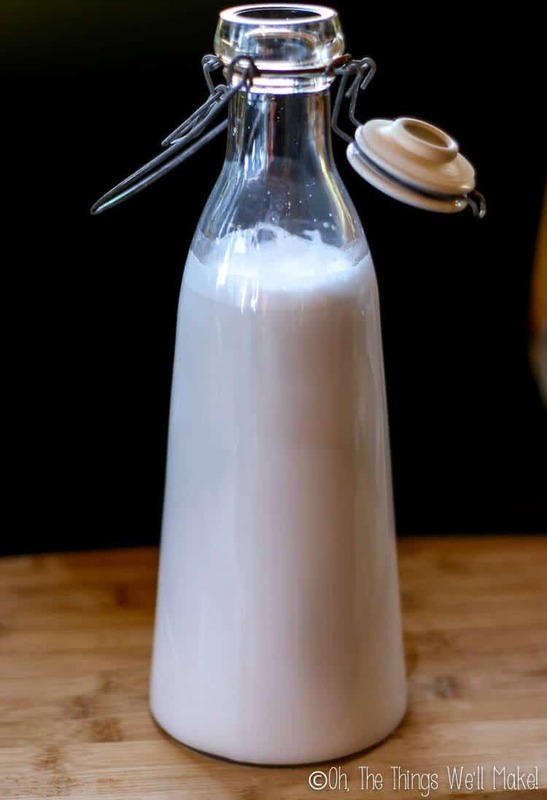 Homemade almond milk made in the same way is another wonderful alternative, and so much better than store bought almond milks. Hi Tracy-Thanks for sharing this. I look forward to trying out these recipes. I’m wondering if when you make the coconut butter, if you are using the coconut pulp from what was left from making the milk or are you using “new” unsweetened flaked coconut? The coconut pulp is really only good for coconut flour because most of the fat has been stripped of it. 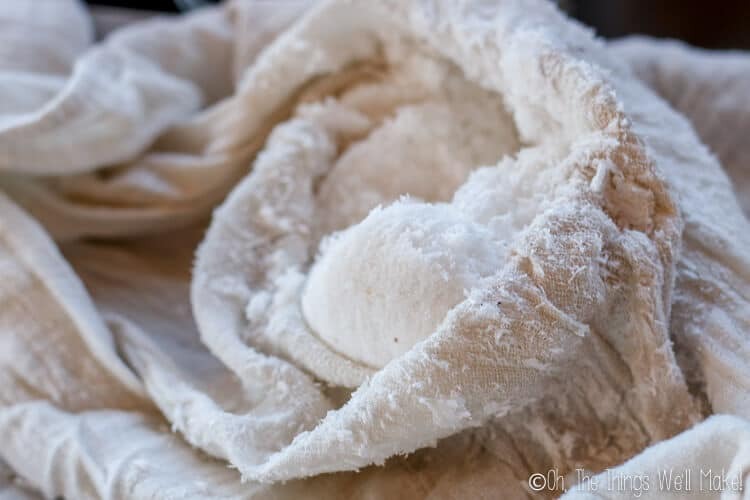 What temperature do you dry the coconut pulp at to make flour? Thanks! You can also use a dehydrator instead. You may not be doing anything wrong, although it does surprise me that you say that it doesn’t taste like coconut at all. Perhaps you could try with less water, maybe even half of the water, and then run it through twice. Homemade coconut milk doesn’t have the added thickeners and emulsifiers that commercially bought coconut milk has. That’s why it’s healthier, but it’s also a lot thinner and will eventually separate into an oil and water layer. 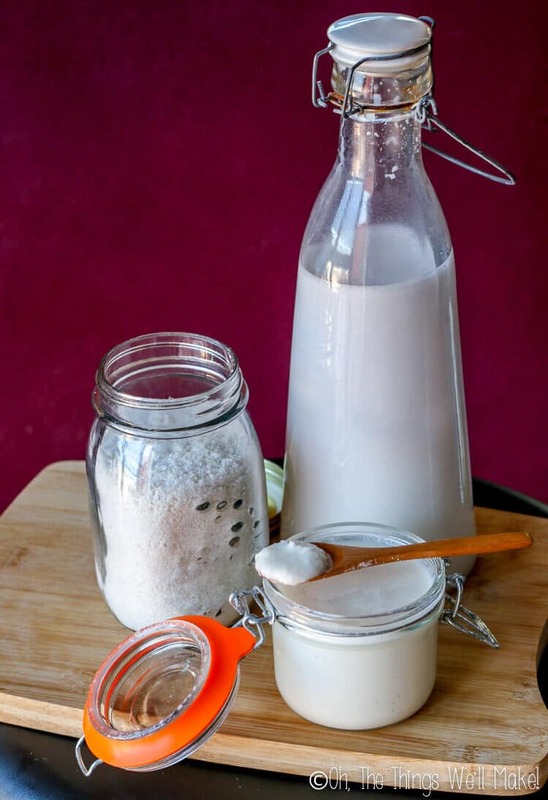 Homemade coconut milk is good for smoothies, and recipes where you don’t need the added thickeners in store bought coconut milk, but it won’t work for making recipes like whipped coconut cream. If everything is getting stuck in the blades of your blender, it may be a blender issue. Mine gets pretty well dispersed throughout the water before I strain it. This is great but I wanted to know …coming from West Africa where there’s an abundance of coconut,can I shred my own coconut and use it ? We have lots of palm trees and I planning to use the fresh coconuts we have. How can I make all this from fresh coconuts? For the milk and flour, you can just shred the fresh coconut meat and begin with that instead of the dried coconut. If you want to make the coconut butter, it’s important to dry out the coconut first so that the finished product will last for a long time, If you were to leave the moisture in the coconut before blending it, I’m not sure what you’d end up with, but it wouldn’t keep anywhere near as long as coconut butter made with dried coconut. I have posts with tips for choosing a fresh coconut and for shredding and drying the coconut if you’re interested. Thank you for the amaing article. As Sri Lankans we use coconut for our every meal. And i am in a struggle with my weight. So hope these recipes; specially coconut flour will work on me. Thanks for your comment, Chami! I hope that you enjoy them and that they work well for you. I’m also going to be concentrating more on my weight this year, but this year I’m tackling the emotional component of eating/holding onto weight. Feel free to follow the blog and see how it goes for me. Do you know what the nutritional macros are for the coconut milk? I have had a hard time finding anything that seems to be accurate when making it yourself. Specifically, I’m looking for… calories, carbs, protein, and fat grams. Thank you in advance, great article! To be honest, I’m not really sure. I would think that it would vary quite a bit depending upon how much of the fat you were able to get from the coconut when squeezing the milk from it. Sometimes if I repeat the process, I am able to get quite a bit more decent quality milk from the second time through. Other times, I can’t. Plus, when I put it in the fridge, sometimes there is a lot thicker layer of coconut oil that solidifies on top than others. Even when following the recipe in the same way, these sorts of homemade things can really vary from person to person, day to day,the coconut used, etc. I wish I could begin to make a guess, but I can’t. Let me see if I can fix it. I think it probably has to do with the fact that I switched the name and URL of that flan post a long time ago. I did a redirect to the new name, and it usually works, but every once in awhile plugins and things change and it breaks my link again! Had I known, I would have never changed the links to any of my posts. Interestingly enough, I just did a search for the recipe on my sidebar and now it’s showing up with the old link instead, so I’ll probably just leave that name for now. I’ll go in and try to fix the post right now. Oops- that didn’t work. I actually had to change the name back and now it seems to be fixed. how much flour does this recipe make? Well, it really depends upon how much shredded coconut you are using. I usually don’t set out to make just coconut flour, but instead save the pulp of the coconut when I make coconut milk and make it into coconut flour. I then save it all up until I’m ready to use it in different recipes, so I’ve never really measured the before and after volume. When you make your coconut milk, most of the pulp remains, but it does shrink a little when you dry it in the oven. Then, when you grind it up, it really depends upon how finely you can grind it. Plan to end up with a little less four than the amount of shredded coconut that you started with, though. Hey Tracy! This looks amazing, I can’t wait to try it! Is there a way to also make Coconut Oil from this? Thanks! Yes, you can get coconut oil from the coconut butter. In warm weather, the oil will separate from the butter and will rise to the top. You can then skim off the oil. Unfortunately, though, you don’t get a lot of it, so it isn’t a very practical way to get enough coconut oil to use for cooking or anything. It is cool to see it, though. I almost doubt that there is an easy way for us to make enough oil for it to be worth our while, but I could be wrong. I’d have to look into it more. If you find a way, I’d love to hear about it. Basically, you can make oil from Coconut Milk. (The recipe I found used raw coconut meat, but maybe you can use shredded coconut as well???) Anyway, after you make the milk, you let it sit for a few hours (to let it solidify slightly), then put it in the refrigerator for 24 more hours. After it’s been in the fridge it looks to me like it separates into something that looks like coconut water, and coconut cream. You take the cream part of it and simmer it for half an hour. You then scoop out the now visible oil, and I presume you throw out the remnants of the cream. Interesting. It seems like a similar process, but I’m still a bit skeptical as to how worthwhile that would be. For me, making my own milk, butter, and flour saves me a lot of money. Sometimes I still buy coconut milk, because store bought lasts longer and works better for certain things, but I try to use freshly made homemade when possible. If you try it, I’d love to hear how it goes! I know you spoke about using shredded coconut. Would these recipes work with fresh coconut if I shred it myself? I have a coconut tree in my backyard and right now I have a pile of coconuts by my backdoor. I have been trying to find things to do with them. For making coconut milk and flour, you shouldn’t have any problems. I’ve been meaning to try using fresh myself, but haven’t gotten around to it yet. The one that concerns me a bit is the coconut butter, though. I’m worried that the extra moisture in the fresh coconut would give a different, more perishable outcome. I would probably dry the coconut in the oven or a dehydrator first. I haven’t tried it with fresh. Coconut butter made with dried coconut lasts for a very long time out of the fridge. If it were made with fresh, I’d keep it in the fridge, and keep my eye on it. I doubt it would last more than a few days, but, like I said, I’m just guessing here. I get my coconut at azure Standard. It’s online they ship and truck their food to drops all over the US. This is a great tutorial! Looking forward to making my own coconut products! I just headed over to your blog, and it’s beautiful! Do you need to refrigerate the coconut flour? I don’t refrigerate mine, but I do make sure it is very dry before storing. If there is residual moisture, I imagine that it could spoil quickly, but I’m also guessing that you would be able to tell right away by it’s odor. I accidentally left my strained coconut out once, forgetting to put it into the oven to dry it, and it smelled very sour in a matter of hours. If you’re in doubt, though, storing it in the refrigerator isn’t a bad idea. I am slightly confused about the coconut butter. Is it just the shredded coconut in a blender or do I add something else? Yes, it is only the shredded coconut. It will release its own oils as it is processed, and almost magically 🙂 becomes coconut butter. It will be a much quicker process in a more powerful food processor, of course. If your food processor isn’t very powerful, and it doesn’t appear to be working, you could add a little coconut oil to help the process along, but I don’t ever add any, and only rely on the oils of the shredded coconut I’m using. Hi! I just made a batch of coconut butter and cannot get over how amazing it tastes! So simple, so cheap, so delicious! Here’s a question though: I want to make a small batch of coconut milk using some of the coconut butter. I assume I can just add water to coconut butter and blend it, but what ratio do you think I should I use to get a standard consistency? The coconut butter still has the pulp of the coconut in it (albeit in much smaller pieces), so if you mix it with water, you really should try to strain out the pulp (which would essentially be coconut flour by that point) if you just want coconut milk. If you don’t strain it, the “flour” in your milk may affect your recipe, depending upon what you’re using it for. I haven’t tried going that route ever, so I don’t really know for sure. I use a 2:1 water to coconut ratio for shredded coconut, and with coconut butter the coconut has a lot less volume so you would be able to add quite a bit more water for the same amount of milk. I, personally, would just experiment with it. It doesn’t have to be “exact,” seeing as different coconut milks on the market have different concentrations of coconut anyway. They even sell “light” versions of coconut milk that have a lower concentration of coconut, with more water. OK, thank you! Yes, I guess either way I’d end up having to strain the milk. I’ll just make coconut milk using flakes then. What brand of coconut are you using for the milk/flour/butter? Anything like that should work! I make my own coconut butter, but when I tried coconut milk it turned so hard in the fridge I couldn’t shake it, stir it or anything. How do you keep it from turning into stone? If it got hard in the fridge, it’s because you did a good job getting a lot of coconut oil/fat in your milk which is solidifying at the colder temperatures. To me that says you have made a good quality coconut milk with lots of “coconut cream.” I’m assuming you have a hard layer floating above a liquid layer? There’s not much you can do other than to warm it a little to liquify it again. I usually make it as I need it, but I do store leftovers in the fridge. I break through the harder layer on top and add a little of both the solid part and the liquid part to whatever I am making. If you are cooking with it, it will liquify again as you cook it. 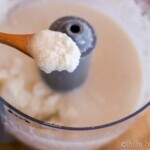 is there any way you know of of making defatted coconut flour? I’m not really sure to be honest. Most of the fat does end up in the coconut milk. The more you soak it and strain it, the more fat you will remove from it. So, I guess you could do a few rinses, letting it sit for awhile in warm water, and straining off the water each time to try to remove more fat. Eventually the water would probably run clear, and there wouldn’t be much fat left in the remaining pulp. This is all speculation on my part; I have never tried it myself. That is awesome. But what is the difference between coconut flour and coconut powder? I think coconut (milk) powder is just dehydrated coconut milk. Coconut flour is made from the fibrous part of the coconut after the milk had been obtained from it. I love flan! Thanks for the break down, and showing that lovely flan picture at the end. I might just make it all!